Remember a few posts back when I let you in on the news that I would be starting a job outside of blogging? Well, it's been about a month since my first day, and guys, I'm effin' beat. How do you work a full time job while having a dedicated side project at the same time? Especially a project that submits to the will of the fickle sun, who likes to start setting shortly after lunch these days. Tell me your secrets, how do you manage everything? (Really, I want to know). Take Thanksgiving for example. Did you know that it's my favorite day of the year? A day dedicated to making a buttload of food, eating, napping, watching TV, then eating some more. Of course you didn't. Because reading my blog, it's as if that day doesn't exist! Though I made a whole 14 pound turkey and 5 different sides for a measly 3 people + 2 cats and we stuffed our faces silly then ate leftovers for days, there was not the faintest glimmer of Thanksgiving here, I couldn't even scrounge up a roasted brussels sprouts recipe for you all, and for that and I am sorry. I failed. 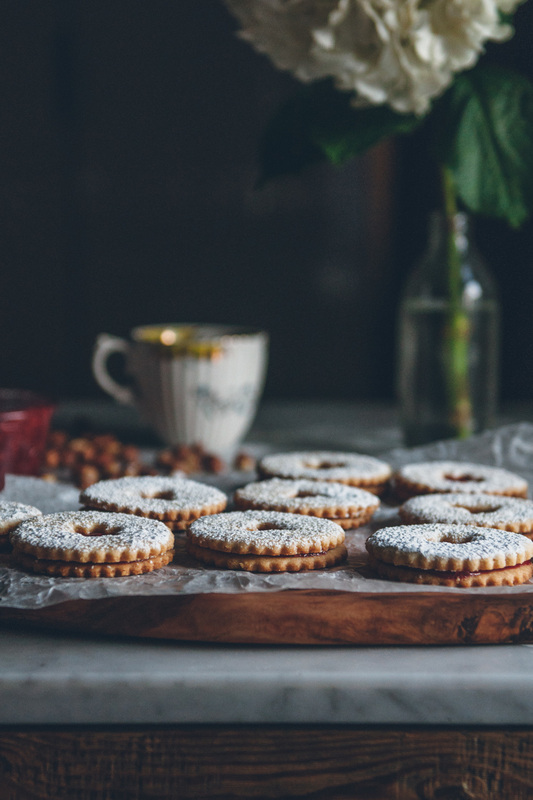 But I'll be damned if I miss the rest of the holiday season, which is why I'm here to make it up to you with these festive linzer cookies. 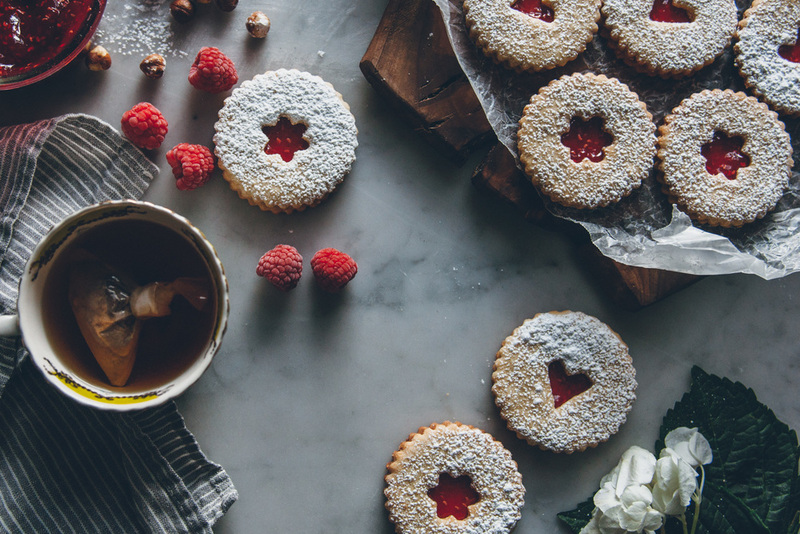 With their ruby red jam and a dusting of snowy powdered sugar, is there a more quintessential winter cookie? I mean, besides gingerbread men, but I don't really consider those Christmas cookies so much as Christmas...decorations. Do people actually eat them? But I digress. Now, under most circumstances, if a cookie does not contain chocolate, I'm more than happy to let someone else eat it. Not these guys. Though they might seem a little sugar cookie-esque at first glance, they are actually nothing like those lifeless, crumbly dog biscuits that are decorated all pretty to make them look deceivingly tasty, when in fact they are not. No, these little darlings taste just as good as they look. The ground hazelnuts give them a nice, light texture. The sweet and tart raspberry jam pairs beautifully with the nuttiness of the cookie, and also softens their texture the longer you store them. However, let's be serious here, they are so delicious that they won't be stored for long before someone eats every last one. Because ground hazelnuts comprise a large portion of this dough, it tends to be quite tender, crumbly and difficult to work with. A pastry scraper is absolutely essential when cutting cookies out and transferring them to a baking sheet, lest you break and tear them. Additionally, patience is key here, I confess that the first time I made these cookies I almost rage quit because I hadn't floured my counter well enough and they kept sticking. Tip: don't do that, rage = bad, patience = good. Fortunately it is also a very forgiving dough, so you can ball it up and re-roll a few times over without the texture being affected. In a large saucepan, add raspberries, sugar, and salt. Turn the heat to medium and bring the mixture to a boil while stirring constantly. It will foam up significantly, so take care that it doesn't boil over. Adjust the heat so the mixture is at a vigorous simmer and cook for about 10 minutes until thickened enough to heavily coat the back of a spoon. Turn the heat off and let cool for 5 minutes. Using an immersion blender, beat the mixture for about a minute. this will release the pectin in the seeds and help to thicken the jam (this is very important, the jam may still be runny after removing it from heat, but it thickens immediately once you start blending). Transfer to a jar and refrigerate until ready to use. Heat your oven to 350 degrees F. Place hazelnuts in one layer on a baking sheet. Toast in oven for 7 to 8 minutes until fragrant. Turn off oven, remove hazelnuts and let cool for 5 minutes. Rub the skins off with your fingers or a clean kitchen towel. It's okay if some of the hazelnuts don't want to give up their skin, as long as you've gotten the majority. When the nuts have cooled to room temperature, transfer them to a food processor along with 1/4 cup granulated sugar. 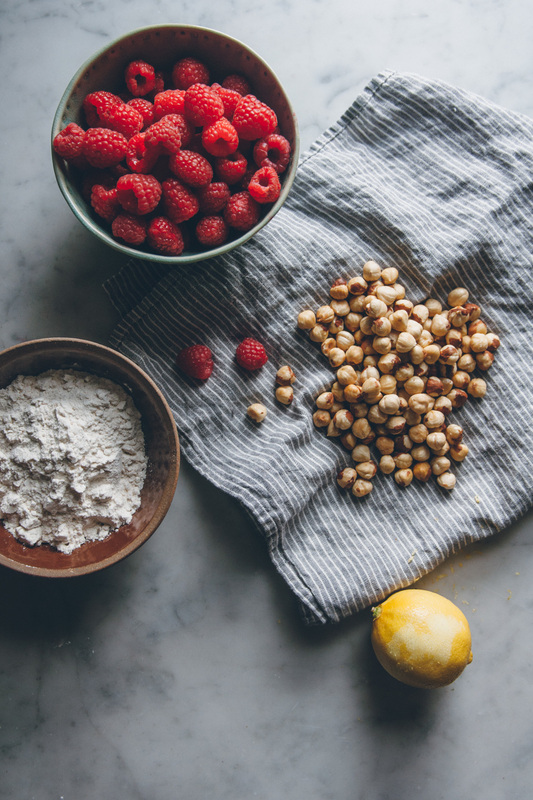 Pulse until the hazelnuts are finely ground. In the bowl of a stand mixer, combine butter and remaining granulated sugar. Beat on medium with the paddle attachment for 3 to 4 minutes until light and fluffy. Scrape down the bowl, add egg yolks and lemon zest, and beat for another 30 seconds until smooth. Add flour, cinnamon, and hazelnut/sugar mixture, and continue beating until just combined, about 1 minute. Divide the dough in half, flatten each half out as much as you can, and wrap tightly in plastic. Refrigerate for at least 1 hour, or overnight. After thoroughly chilled, remove one portion of dough from the fridge, unwrap the plastic, and transfer it to a very well floured counter. Roll dough out until approximately 1/8 inch thick (the edges will most likely crack during the process, so just take your hands and press the dough to bring it back together, I also recommend alternating between starting from the center versus starting along the edges with your rolling pin). Using a 2 to 2 & 1/2 inch fluted cookie cutter, cut out rounds as close to each other as possible. Then, using a small 3/4 to 1 inch cookie cutter, cut the centers out of half the cookies. Transfer to a parchment paper lined baking sheet (a pastry scraper makes this task much easier). Gather up the excess dough, reform it into a flattened round, re-wrap it in plastic, and chill in fridge while you work on the second portion of dough. Repeat the process until all of the dough has been used. Heat oven to 350 degrees F. Bake cookies for 8 to 10 minutes on the upper-middle rack until the edges just start getting some color. They will turn from a lovely gold to a dark brown in the span of one minute so keep a close eye on them toward the end. Additionally, for the most even color, bake only one sheet at a time. If you must do two at a time, bake them on the upper-middle and upper racks of your oven and switch the positions of the baking sheets halfway through. Once baked, remove cookies from oven and let cool to room temperature. Separate the tops and the bottoms. Using a small fine mesh sieve, dust the tops with a thin layer of powdered sugar. Spread a teaspoonful of raspberry jam on the bottoms. Sandwich both sides together. If you prefer your cookies crispy, enjoy immediately. If you like them a bit softer, let them sit in a sealed container for half a day, then enjoy!